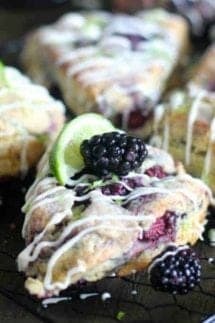 Jump into spring with these delicious scones that are loaded with fresh blackberries and tangy lime. They make the perfect treat for you Spring get-togethers. In a large bowl or the bowl of your food processor, blend together flour, sugar, salt, baking powder and soda. Add cold butter slices and cut into flour or pulse until small clumps form. Add half & half, lime juice and zest, and egg and mix or pulse until just combined. If using frozen blackberries, add to the dough and pulse with food processor 2 times until combined. If using fresh blackberries, knead into dough with clean hands. Bake scones for 12 minutes or until the edges begin to turn golden brown. Cool completely before icing. To make the glaze, combine powdered sugar, lime juice and zest, and whisk until smooth.